This past Tuesday, January 15th, I was privileged to participate in a “Pray-In for the Climate” held in Washington D.C. 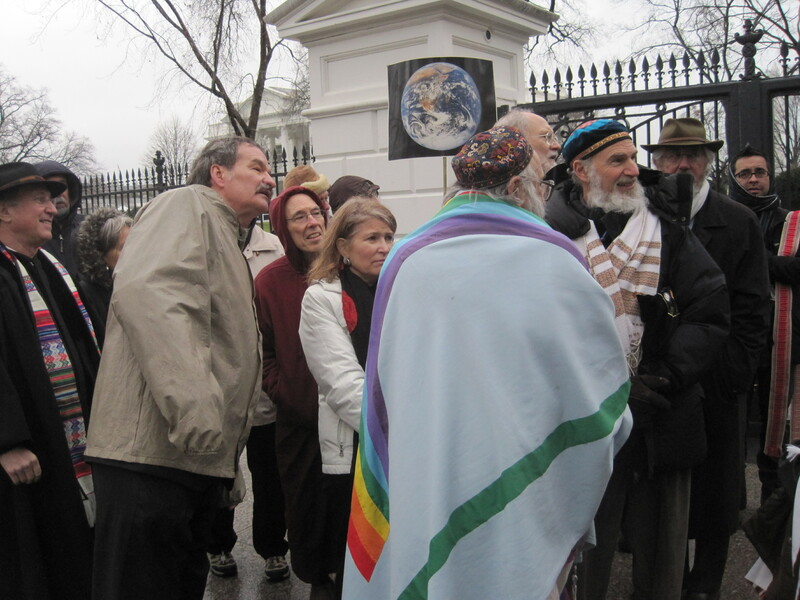 The gathering was organized by the Interfaith Moral Action on Climate (IMAC), a coalition of people from different faiths united in the recognition that we need to act—and act promptly—to stop the warming of our planet. The pray-in was deliberately scheduled for the actual birthday—rather than the official birth celebration—of Rev. Dr. Martin Luther King. During his life Rev. 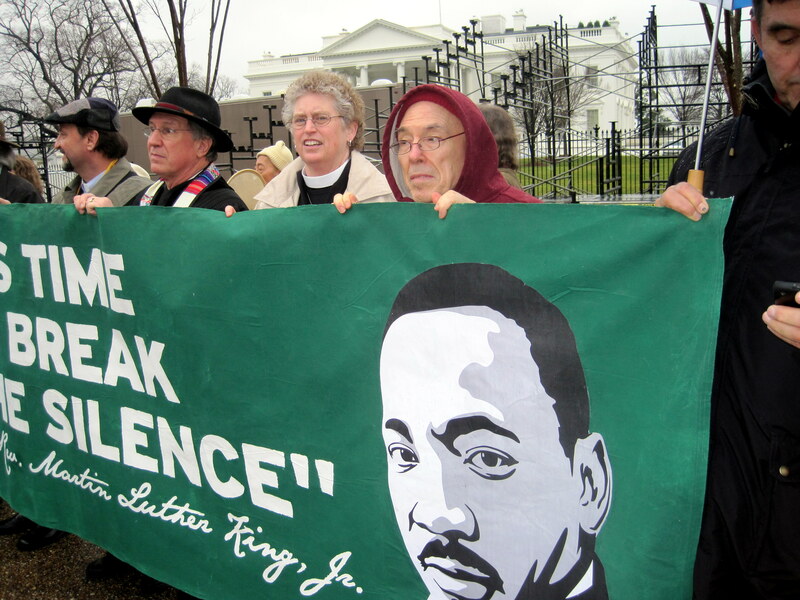 King had been an outspoken critic of the “triple scourge” of racism, poverty , and militarism, and we all concurred that if he were alive today, he would have added climate change to this set. But we do so at our own peril! Since we all share a common atmosphere and are bordered by the same oceans, we too are at risk. There is no country and no person exempt from the disasters being whipped up by a hotter climate. This past year we’ve seen the chickens starting to come home to roost. Here in the U.S. we’ve been hit by powerful killer storms the likes of which we’ve never before seen, and we’ve had to deal with long droughts that decimate harvests and drive up food prices. 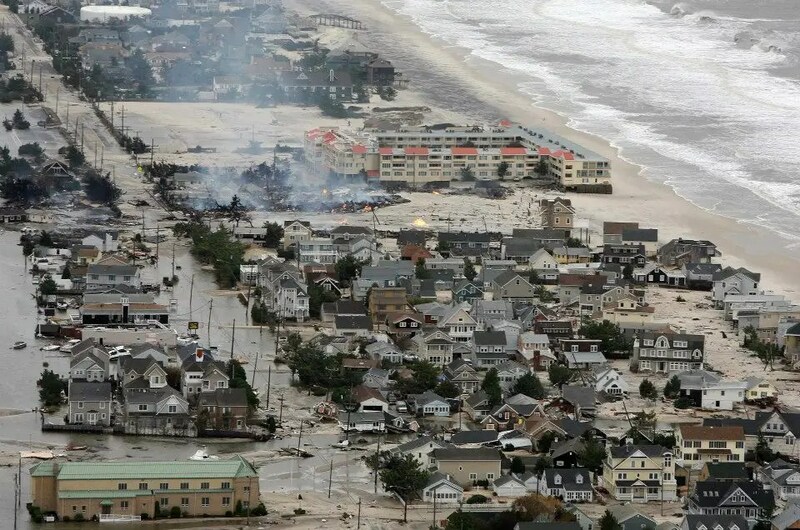 In late October Superstorm Sandy slammed into the east coast, inundating cities, demolishing homes, ripping away lives, and leaving a price tag in the billions. Such drastic events are certain to become “the new normal.” And this threat grows ever worse as the deniers snicker, the oil barons gloat, and our leaders dither in silence. 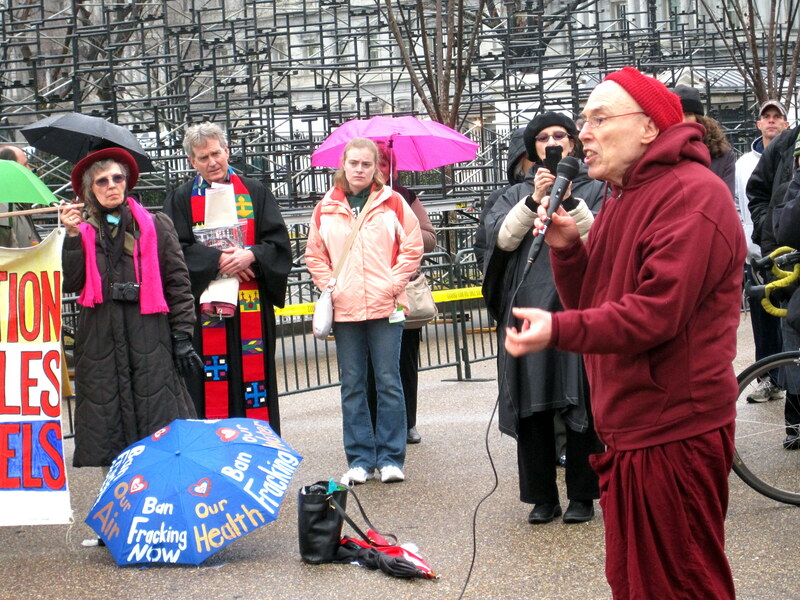 January 15th was a cold, gray, rainy day in Washington, but the dreary weather did not deter roughly two hundred people from turning up to give a collective shout: “The time for action is now!” Among those who joined hearts and hands were Catholic nuns, Christian evangelicals, Native Americans, Jewish rabbis, Muslim imams, a Sikh leader, and three Buddhist monastics (a monk and nun from Nipponzi Myohoji and myself). Also present was the redoubtable NASA climate scientist Dr. James Hansen, who has been warning our government about the dangers of climate change since the 1980s. 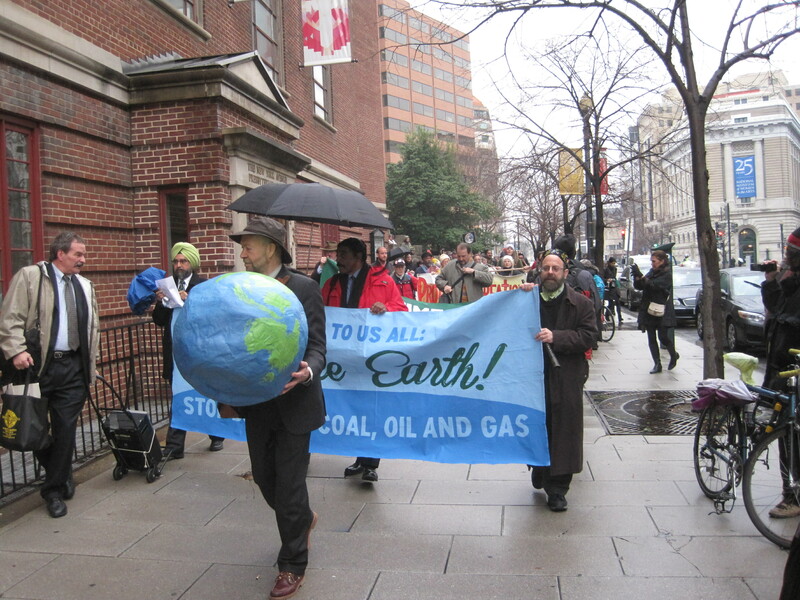 The gathering began at 11 am at the Presbyterian Church on New York Avenue with an interfaith service that featured short talks and reflections punctuated by songs and a Native American chant of reverence for the earth. When the service was concluded, everyone left the church and marched in procession to the White House, with the Nipponzi Myohoji group keeping time with their chant and beating of their drums. At the head of the procession, Dr. Hansen carried a paper maché model of planet earth. After a twenty minute walk through the drizzly streets of D.C., we reached the White House complex on 17th Street, where we formed a semi-circle and began the “Pray-In for the Climate,” facilitated by Jacqui Patterson of the Environmental & Climate Justice Program of the NAACP. publicly support a carbon fee; end subsidies to the fossil fuel industries; and promote the development of renewable and sustainable clean sources of energy. At this point, eighteen of us left the main group and approached the gates to the White House, where we stood risking arrest. The other participants, who remained on the street, read aloud the names of the victims of Superstorm Sandy, including their ages and the causes of their death. As I listened to the reading, I noticed that a large number of the victims—perhaps the majority—were either elderly people in their 70s and 80s or children not yet in their teens. The causes of death included drowning, building collapse, electrocution, and being crushed by fallen trees. None of the demonstrators were arrested, perhaps because the White House staff was reluctant to risk stormy publicity so close to the President’s day of inauguration. By 2:00 pm the pray-in was finished and we went our separate ways. It’s uncertain whether President Obama learned about the faith-based demonstration held outside the gates of his home. Even if he learned about us, it’s possible he gave our appeal no more thought than he would the oil lobby’s insistence that he immediately approve the Keystone pipeline. That same day, however, eighteen top climate scientists—including Jim Hansen—sent the President a letter urging him to reject the pipeline. You can find the text of the letter and the signatories here. With both religious leaders and climate scientists arrayed against the Keystone project, it would be an act of folly or weakness for President Obama to give TransCanada—the company that would construct the pipeline—the green light to start work. To learn more about IMAC, check out its website, where you will find a number of resources. IMAC campaigns in preparation include an initiative to persuade national religious bodies to divest from fossil fuel companies, and advocacy for carbon pricing and a carbon tax based on the moral principle that the polluter must pay. My thanks are due to Edwin Dominguez for accompanying me on the trip to Washington and to Glen Harrison and Janice Sims for offering us hospitality at their home. This entry was posted in Climate change, Engaged Buddhism, Interfaith action and tagged Climate change, Engaged Buddhism, Global warming, Interfaith action, White House. Bookmark the permalink.